Every so often a company creates a product that is so innovative and long-lasting that they become proprietary eponyms. Proprietary eponyms are brand names for products that are so popular that they become commonly used for the product even if it’s made by a different manufacturer. Some examples include kleenex, jello, band-aid, white out, frisbee, and scotch tape. Older folks may even remember “fridge” from Frigidair refrigerators, “xerox” from Xerox copy machines, and “windex” from Windex glass cleaner. So names can be important. When children are born, often the parents look for the literal meaning of the name itself. Or there may be a great significance to the name within the paternal or maternal side of the family. Last names are gaining in importance in the U.S. as more and more people become interested in tracing their ancestry. My wife and I have become very interested in tracing our family backgrounds for the past several years. So, what’s in a name? 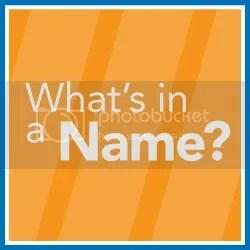 According to AllAboutJesusChrist.org, In the days when the Bible was being written, the Israelites often chose names for their babies based on the child’s character or appearance, i.e. Esau (hairy) and Korah (bald). Some babies were named because of an incident at their birth or their names were based on some hope or prayer of the parent, as in Zechariah’s name (God has remembered). Sometimes babies received the name of an everyday object, like Tamar (palm tree), and Tabitha (gazelle). Parents often named their children by the time of day they were born. For example: Shaharaim (dawn), Hodesh (new moon). The condition of the mother also frequently inspired a name: Leah (exhausted) and Mahli (sick). Jesus was named prophetically. Matthew 1:20-23 says, “But after he had considered this, an angel of the Lord appeared to him in a dream and said, ‘Joseph son of David, do not be afraid to take Mary home as your wife, because what is conceived in her is from the Holy Spirit. She will give birth to a son, and you are to give him the name Jesus, because he will save his people from their sins. According to some scholars, there are over 700 ways to refer to Jesus in the Bible. Some of the more well-known ones are; Alpha and Omega, Ancient of Days, Bread of Life, Bridegroom, Bright and Morning Star, Chief Cornerstone, Emmanuel, Faithful and True, Deliverer, Great Shepherd, Messiah, Holy One, Head of the Church, Judge of the Quick and the Dead, Just One, King of the Jews, Light of the World, Lion of the tribe of Judah, Lord, Living Water, Prince of Peace, Resurrection and the Life, Savior, and the Word of Life–just to name a few. Why are there so many different titles and words used to refer to Jesus? They serve as a description of who Jesus is and how He works in the lives of individuals. But let’s concentrate on the name, Jesus, itself. In the New Testament, in Luke 1:31 an angel tells Mary to name her child Jesus, and in Matthew 1:21 an angel tells Joseph to name the child Jesus during Joseph’s first dream-encouraging him to wed Mary. There have been various proposals as to how the literal etymological meaning of the name, Jesus, should be translated, including: YHWH saves, (is) salvation, (is) a saving-cry, (is) a cry-for-saving, (is) a cry-for-help, (is) my help. But you get the picture. There is salvation in no one else! God has given no other name under heaven by which we must be saved (Acts 4:12). For this reason also, God highly exalted Him, and bestowed on Him the name which is above every name, so that at the name of Jesus EVERY KNEE WILL BOW, of those who are in heaven and on earth and under the earth, and that every tongue will confess that Jesus Christ is Lord, to the glory of God the Father (Philippians 2:9-11). And for those who believe in Him, And these signs will accompany those who believe: In my name they will drive out demons; they will speak in new tongues; they will pick up snakes with their hands; and when they drink deadly poison, it will not hurt them at all; they will place their hands on sick people, and they will get well (Mark 16:17-18). And if we don’t praise His presence as we should, He replied, “If they kept quiet, the stones along the road would burst into cheers (Luke 19:40)! He is God’s son. He is God. He is our savior. By His name we are saved, and in His name we live and breathe. There is nothing else. Amen Ken! There is such power in the name of Jesus. May we continually use it and access it aright. Thanks, Pastor J, for your consistently encouraging words and for ideas to improve and expand our outreach. The days for expansion are upon us!